There’s one style of knitting that perhaps has an aura of myth above all others, one that even non-knitters know and admire. You know the one – the Aran sweater. Oceans of cream cables laden with symbols. Worn by fishermen on the Aran islands for thousands of years. Each sweater inscribed with unique motifs that could identify a fisherman’s drowned body after his ship was lost at sea. Funny thing about those legends – they’re not true. When we talk about “Aran sweaters,” we’re talking about the heavily cabled, cream-colored sweaters that hail from the Aran Islands, a cluster of three islands in Galway Bay off the coast of Ireland, named Inishmore, Inishmaan and Inisheer. Their cliffs jut dramatically into the Atlantic Ocean and the rocky soil doesn’t make for fertile farming, but tenacious men, women and monks have called these islands “home” for hundreds of years. It’s a land full of pagan myths and history. Do a quick search online for photos – it’s magical and gorgeous. Throughout the 18th and 19th centuries, Aran islanders’ lives were incredibly hard. They subsisted on simple crops like potatoes, and kept pigs and cows along with sheep for wool. Surprisingly, they didn’t make their living off of fishing – while the islanders were experienced fishermen, they weren’t able to afford boats large enough to take full advantage of the nearby fisheries. By the turn of the century, islanders were reliant on exporting kelp to the chemical industry for fertilizer for most of their income. Famine, crop failure and poverty were a persistent reality. And guess what? Up until the early 1900s, there is no historical record of what we now call Aran sweaters. In fact, the only evidence of knitting on the islands is of wool stockings. In 1936, a man named Heinz Edgar Kiewe stepped into a Dublin shop and happened upon a sweater. It was a striking cream pullover with a center panel of braided cables and an intricate combination of zigzags, twisted stitches and moss stitch framing the center braids. A photograph of the sweater was later published in Mary Thomas’s Book of Knitting Patterns (1943), the first book ever to publish an image of an Aran sweater. Kiewe, a Prussian-born, self-styled anthropologist, is responsible for much of the resulting international fame of the Aran sweater, as well as the fables surrounding it. He later went on to write books like The Sacred History of Knitting (1971) in which he makes dubious claims about the history and origins of the Aran sweater and its cable motifs. 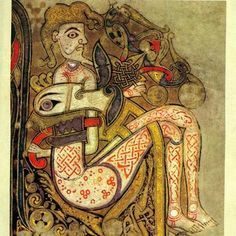 In one such claim, he argues that a figure in The Book of Kells (circa 800 CE) is wearing a knitted catsuit, and therefore the Aran sweater has clearly been around since that time period. Taking a closer look at the image, it’s easy to see that the heavily-stylized figure could be wearing a woven outfit, a knitted outfit, or no outfit at all. Another pervasive myth is that the Aran sweater was made for and worn primarily by fishermen. In fact, there is no evidence that the Aran sweater was ever a traditional fisherman’s garment at all! All photographic evidence points to Aran fishermen wearing ganseys that were likely bought on the mainland and produced by contract knitters in Britain — ganseys being thinner, seamless garments with underarm gussets for movement, and decorative knit-purl patterning contained to the upper portion of the sweater. What the earliest photo evidence of Aran sweaters shows, according to Deirdre McQuillen in her compact history The Aran Sweater, is that the heavily patterned white sweater may well have gotten its start as a communion sweater for children. As for the story that the Aran sweater was used to identify a dead fisherman? This fabrication likely arose from playwright J.M. Synge. In his play, Riders to the Sea, a drowned man is identified by the dropped stitches in one of his stockings. At this point, it’s worth noting that the strongest argument I’ve found for the origin of the Aran sweater is from Alice Starmore’s book, Aran Knitting. I read several other chapters regarding Aran sweaters in classics like Patterns for Guernseys, Jerseys and Arans by Gladys Thompson; A History of Hand Knitting by Richard Rutt (also a key source for McQuillen); and Knitting in the Old Way by Priscilla A. Gibson-Roberts and Deborah Robson. None were as detailed and thorough as Starmore in digging into the history and questioning assumptions about the origins of the craft. Starmore, a revered Scottish knitting designer, clearly has an axe to grind against Kiewe and others who have perpetuated the Aran myths. The book is worthwhile for the gorgeous patterns alone, but it’s her thorough research into the history and dismantling of the fabrications that make it such a gem. Starmore makes quick work of Kiewe’s crockpot history. But then she digs deeper, and actually visits the eleven Aran sweaters in the collection of the National Museum of Ireland. The true history of the Aran sweater, she argues, can be found right where it started – in the knitting itself. From this evidence, Starmore draws several conclusions about the construction, style and patterns of Aran sweaters. I have condensed and paraphrased some of her key findings here, but encourage you to check out her book for more detailed explanations. First, the Aran sweater evolved from the traditional Scottish gansey. In 1891, the Congested Districts Board was established to help stimulate the economy on the Aran Islands, primarily with farming and fishing. Around the turn of the century, the Board brought in Scottish women, known as “herring lassies,” to help energize the fishing industry. These women were experts at gutting, filleting and packing fish, and were most numerous on the islands during World War I. And whenever they weren’t working or were taking a break, they were knitting. It’s most likely that Aran women learned Scottish gansey knitting techniques from these herring lassies. As techniques for knitting sweaters didn’t arrive on the Aran Islands until the early 1900s, any claim that an Aran sweater “tradition” is hundreds of years old, and has been passed down generation to generation, rings false. As the hand knitting industry began to pick up in the 1930s, Starmore argues that the development of the sweater design and patterns became heavily influenced by commercial considerations – basically, what would sell to tourists. Some examples of this can be seen in the color choices, weight of the yarn, and designs of these sweaters. The earliest Aran sweaters that Starmore has identified were cream, red and navy, but she thinks that the classic white won out because it shows the stitches most clearly. Same goes for the heavy weight of yarn used, which create bold, striking patterns with the greatest visual impact. Lastly, the most dominant patterns in Aran sweaters have evolved from openwork patterns, chevrons, and delicate twisted stitches to ropes, braids, honeycombs, diamonds, moss stitch and bobbles – a combination of patterns, she argues, that won out because they were most marketable as masculine fishermen’s sweaters. Of course, these are her own conclusions, and it’s very possible that the common design elements of the Aran sweater evolved for a variety of additional unknown reasons. An Aran sweater is a hand knitted garment of flat construction, composed of vertical panels of cabled geometric patterns and textured stitches. On each piece of the sweater there is a central panel, flanked by symmetrically arranged side panels. The use of heavy, undyed cream wool is a classic – though not essential – component of the style. Of course, when knitting your own Aran-inspired sweater, you can take any bit of this definition and follow it, discard it, or evolve it to make something that’s truly unique and your own. When knitting a swatch for this month, I knew I wanted it to include two elements – the yarn must be a natural cream wool, and the knitting must include cables. Lots of cables. Beyond that, the possibilities for a classic Aran sweater are seemingly endless, as you can incorporate any variety of rope cables, braided cables, twisted stitches, bobbles and more into a pattern. As for the cables, I’ve knit plenty before, including rope cables, honeycombs and twisted stitches. But I had never worked braided cables, so I decided to knit a swatch that included a group of them, as outlined in “Swatch 8” in Starmore’s book. The exciting thing about this family of cables is that they become increasingly more complex as you move right to left. The two cables on the right are basic plaits, the first with four strands and the second with five. The center braid is identical to the second braid, but with a single purl stitch worked between each rope. Moving even further to the left, the next braid shows the knit stitches moving across the purl background by one stitch before crossing over each other. The final braid on the far left is the most complex, incorporating all of the crosses of the previous two braids. Overall, Starmore’s swatch was a fantastic study in braided cables, and one I’d highly recommend practicing to increase your understanding of cable construction. This entry was posted in Columns and tagged knitting, swatch of the month. Bookmark the permalink. Fascinating! Thank you so much! I’ve visited the Aran islands – you’ve brought back memories and an urge to knit an aran sweater for my husband. We plan to visit again. I still find it funny that having something knit basically the same way for the past hundred or so years doesn’t make it “traditional” yet and that is just taking from the early 1900s date. It doesn’t really matter. I just have a strange sense of humor. But I do need to see if I can get my hands on a copy of that Starmore book. It looks like it would be interesting to read. yeah I guess to me it seems like having a style of sweater that has been made for 100 years is still pretty important considering how fast other fashion trends/styles/garments fade. maybe it’s because I can’t think of any other sweater styles that have been around longer? lopapeysas were designed in the 50s, fair isle is pretty close in date to the arans, the earliest knitted cowichan sweaters are from the 1850s, can anyone think of a garment that is still popular/being knitted and designed that is older? I don’t think saying the legends aren’t accurate or that it’s not as old as they suggest is at all the same as saying it’s not traditional or important! Only that the truth of the tradition is different from the myth. What an educational article, myths and facts. I had always heard that they used the sweaters for identifying bodies and now I know the truth. I found the book in my case and will have to see how I can incorporate some cables for the KAL. I also found some yarn from Juniper Moon farms that I bought when they were selling seasons and there is enough for a sweater with lots of cables. Love that cream wool. And the cables look great! One problem I’ve always had is the left-most knit stitch of a cable…you know when you transition from knit to purl (on the RS)? It gets all loose and wonky. I’ve tried Ysolda’s method where you try purling differently, but I still get that loose stitch. Any tips? Great reading. Love Alice Starmore! BTW, can you recommend a good Gansey pattern? Not too off topic, I hope! Thanks, Jess, for another great read! I am loving this series, especially your thoughtfulness and careful research (not to mention the links to sources). Makes my nerdy heart sing. I am fascinated how the construction of a romantic myth of a time-immemorial tradition happens over and over again, for cultural artifacts ranging from hand crafts to cuisine. Clearly it’s an effective marketing strategy! When thinking about how this applies to cottage-industry knitting, I am struck by the differences in the images conjured up by the myth and the history. In one telling, you have industrious women faithfully continuing a tradition handed down from their grandmothers’ grandmothers — domesticity, fidelity, happy submission to an unchanging social role. In the other telling, you have entrepreneurial women picking up new skills and mashing up existing forms to arrive at powerful innovations, all with a sharp eye on the marketplace (including, perhaps, participating in their own romanticization?) — creativity, ambition, using available tools to improve your situation however you can. So many of the details of these histories don’t survive, but I am endlessly fascinated by the facts that can be gathered, and how they may surprise us. How many other stories can we tell? I highly recommend you check out Imagine Communities, if you haven’t read it yet. It talks about the use of cultural constructs and embroidered histories in nation-building. It’s pretty readable for a scholarly work, too. A very mouth-watering swatch (for some reason, looking at plump cables does that to me) and a great article! It reminds me of some of the posts the knitting geneologist (based in Yorkshire) has written on myths about ganseys and spinning. Like Arans, ganseys also supposedly were knit with distinctive designs to help identify bodies and these designs were supposedly clan-based, both of which myths are apparently beloved enough that her counter claims inspire quite a bit of fiery debate in the comments section. It’s interesting to ponder these kinds of patterns of cultural transmission and evolution. I haven’t noticed anything that I’d call a uniquely Amdo style of design or knitting (though everyone seems to knit the English way), but maybe that’s because knitting seems pretty recent (1960’s or later), has never been a real industry, and as soon as ready made clothing became more available and more affordable, people seem to have dropped it pretty quickly–it’s enough of a struggle to maintain the production of what you might call “real” traditional textile traditions, like the manufacture of feltware and leather (or fake leather) clothing, hats and footwear. I do see handknit stuff from time to time, though, but some of it might be a couple decades old. Anyway, tldr: you’ve inspired me to take up swatch knitting as an end project in itself. I’ll start soon as I get reunited with my stash. I made my first cabled aran sweater back in the 1980s. It was cream coloured, had a shawl collar and pockets and it must have taken a few years to complete. Then last week I was cleaning out some old papers and found the pattern, complete with cryptic notes. Still have the sweater, and I still have to fix the collar. It was done with short rows , and the pattern had you reverse all shapings which was easier said than done..
Our local library carries that Alice Stanmore book, but I must get it out and have a good read of all the sections again. I’ve just completed a couple of cabled projects (one sweater, one hat) and I’m itching for another cabled project. I think an Aran sweater would be right up my street. My mum knit me several when I was a kid (I think she really enjoyed cables too).